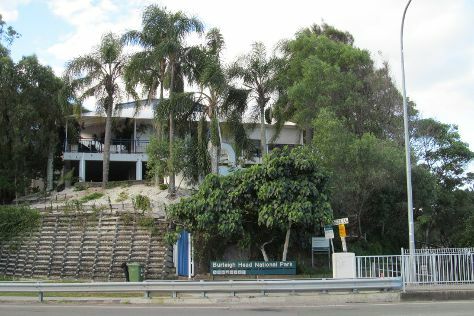 Step out of the city life by going to Kirra Beach and Lone Pine Koala Sanctuary. We've included these beaches for you: Burleigh Head National Park and Bulcock Beach. Explore Brisbane's surroundings by going to Caloundra Lighthouses (in Kings Beach) and Slideways - Go Karting Gold Coast (in Nerang). Spend the 11th (Sat) observing fascinating marine mammals with a dolphin and whale watching tour. There's much more to do: contemplate in the serene atmosphere at Catholic Old St. Stephen's Church (chapel), take in the waterfront at Eagle Street Pier, make a trip to Boggo Road Gaol, and take in the architecture and atmosphere at Cathedral Square. To find more things to do, maps, where to stay, and more tourist information, use the Brisbane trip itinerary builder site . The Route module can give you travel options from your home to Brisbane. In January, daytime highs in Brisbane are 34°C, while nighttime lows are 25°C. Wrap up your sightseeing on the 13th (Mon) early enough to travel to Wollongong. Wollongong, informally referred to as "The Gong", is a seaside city located in the Illawarra region of New South Wales, Australia. Get outdoors at Callala Beach and Moona Moona Creek. 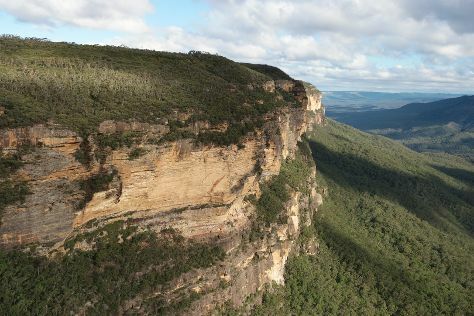 Discover out-of-the-way places like Wentworth Falls and Bridal Veil Falls. Get out of town with these interesting Wollongong side-trips: Jervis Bay (Jervis Bay National Park & Murrays Beach), The National Pass (in Blue Mountains National Park) and Kiama Harbour (in Kiama). The adventure continues: look for gifts at Stockland Shellharbour and brush up on your military savvy at Breakwater Battery Military Museum. To see other places to visit, reviews, ratings, and more tourist information, use the Wollongong travel route planning website . Getting from Brisbane to Wollongong by flight takes about 5 hours. Other options: do a combination of flight and train; or drive. Expect slightly colder evenings in Wollongong when traveling from Brisbane in January, with lows around 20°C. Wrap up your sightseeing on the 17th (Fri) to allow time to travel to Melbourne. Visiting Eastern Beach Reserve and Phillip Island Wildlife Park will get you outdoors. Get some historical perspective at Old Melbourne Gaol and Shrine of Remembrance. Get out of town with these interesting Melbourne side-trips: Ballarat (Lake Wendouree & Ballarat Wildlife Park), Ocean Beach (in Nelson) and St Augustine's Church (in Creswick). Next up on the itinerary: stroll through St. Kilda Beach, take in the spiritual surroundings of St Paul's Cathedral, take a tour by water with Boat Tours & Water Sports, and contemplate the long history of Parliament House of Victoria. To find other places to visit, more things to do, reviews, and more tourist information, go to the Melbourne trip planner . Getting from Wollongong to Melbourne by combination of train and flight takes about 5 hours. Other options: drive; or take a bus. Traveling from Wollongong in January, plan for little chillier nights in Melbourne, with lows around 17°C. Wrap up your sightseeing on the 23rd (Thu) to allow time to travel to Adelaide. Get outdoors at Carrickalinga Beach and Horseshoe Bay. You'll get in some beach time at Aldinga Beach and Maslin Beach. Step out of Adelaide to go to Cudlee Creek and see Gorge Wildlife Park, which is approximately 44 minutes away. And it doesn't end there: glide peacefully along the water with some of the best stand-up paddleboarding in the area, learn about winemaking at Ashton Hills Vineyard, explore the different monuments and memorials at Centennial Park Cemetery, and stroll through Glenelg Beach. To find ratings, where to stay, photos, and tourist information, you can read our Adelaide road trip planning tool . You can fly from Melbourne to Adelaide in 3.5 hours. Alternatively, you can drive; or take a train. In January in Adelaide, expect temperatures between 34°C during the day and 19°C at night. Finish your sightseeing early on the 27th (Mon) to allow enough time to travel to Perth. Escape the urban bustle at Kayaking & Canoeing and Mullaloo Beach. 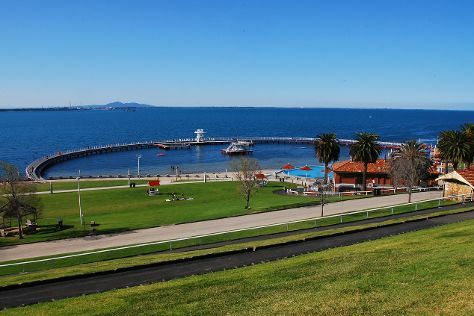 Explore hidden gems such as Rockingham Beach and Waterskiing & Jetskiing. Explore Perth's surroundings by going to Dolphin & Whale Watching (in Mandurah) and Fremantle Prison (in Fremantle). Next up on the itinerary: kick back and relax at City Beach, take in the architecture and atmosphere at St John's Anglican Church, Fremantle, and take in the spiritual surroundings of St. George's Cathedral. Start your trip to Perth by creating a personalized itinerary on Inspirock. You can fly from Adelaide to Perth in 5.5 hours. Other options are to take a train; or drive. You'll gain 1 hour traveling from Adelaide to Perth due to the time zone difference. Expect somewhat warmer weather when traveling from Adelaide in January: highs in Perth hover around 38°C, while lows dip to 20°C. Finish your sightseeing early on the 31st (Fri) to allow enough time to travel to Broome. Start off your visit on the 1st (Sat): stop by The Sandalwood Gallery Broome, look for all kinds of wild species at Broome Bird Observatory, then examine the collection at SSJG Heritage Centre, and finally stroll through Reddell Beach. For reviews, traveler tips, photos, and tourist information, read our Broome trip itinerary builder website . Traveling by flight from Perth to Broome takes 4.5 hours. Alternatively, you can drive; or take a bus. 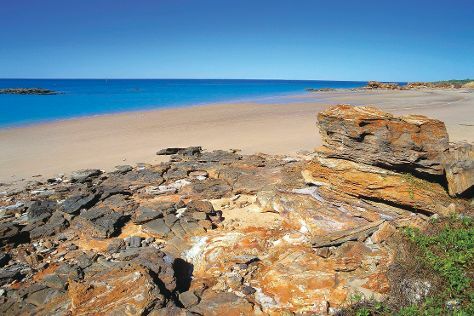 Traveling from Perth in January, you can expect nighttime temperatures to be a bit warmer in Broome, with lows of 30°C. Wrap up your sightseeing on the 1st (Sat) to allow time to travel to Uluru-Kata Tjuta National Park. Escape the urban bustle at Uluru and Kata Tjuta. There's much more to do: admire the verdant scenery at Valley of the Winds, get outside with Walpa Gorge, go for a walk through Field of Light, and hike along Kuniya Walk. For other places to visit, traveler tips, and tourist information, refer to the Uluru-Kata Tjuta National Park itinerary maker app . You can fly from Broome to Uluru-Kata Tjuta National Park in 13.5 hours. Another option is to drive. The time zone changes from Australian Western Standard Time to Australian Central Standard Time (Northern Territory), which is usually a 1 hour difference. When traveling from Broome in February, plan for a bit warmer days in Uluru-Kata Tjuta National Park, with highs around 43°C, while nights are little chillier with lows around 25°C. Finish up your sightseeing early on the 4th (Tue) so you can travel to Cairns. Relax by the water at Four Mile Beach and Palm Cove Beach. Take a break from the city and head to Scuba & Snorkeling and Safaris. Change things up with these side-trips from Cairns: Wildlife Habitat Port Douglas (in Port Douglas), Hartley's Crocodile Adventures (in Palm Cove) and Birdworld Kuranda (in Kuranda). There's still lots to do: identify plant and animal life at Atherton Tablelands, step off the mainland to explore Michaelmas Cay, and hike along Esplanade Boardwalk. To find reviews, maps, other places to visit, and more tourist information, read our Cairns travel route planning website . You can fly from Uluru-Kata Tjuta National Park to Cairns in 5 hours. Alternatively, you can drive. While traveling from Uluru-Kata Tjuta National Park, expect slightly colder days and about the same nights in Cairns, ranging from highs of 36°C to lows of 28°C. Wrap up your sightseeing on the 10th (Mon) early enough to travel back home.